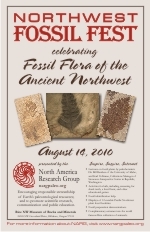 NARG is sponsoring a free event for families to learn about fossils, fossil collecting, preparation, identification, and display. 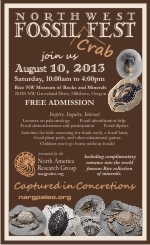 There will be informative displays, demonstrations, and educational activities for children. 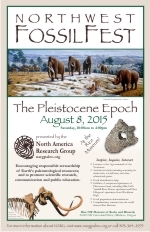 Lectures are scheduled on fossil horse presence and evolution both locally and worldwide. 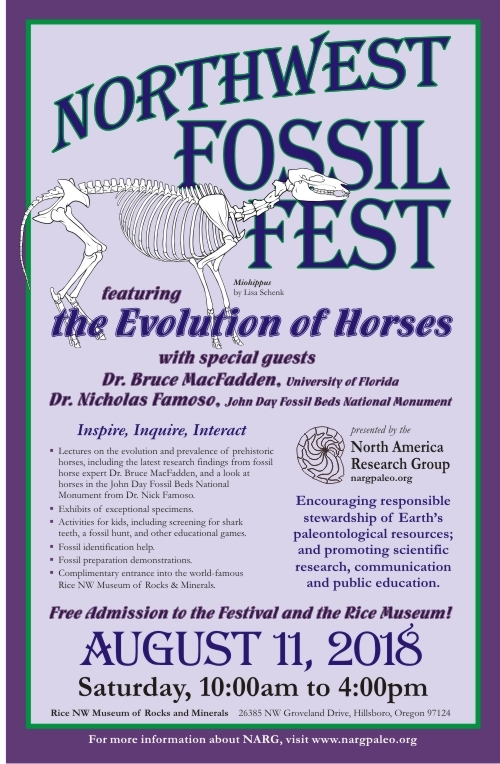 Perhaps the country's leading expert of fossil horses, Dr. Bruce MacFadden from the University of Florida, will be our esteemed guest lecturer. 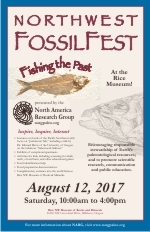 We will also have a presentation by Dr. Nick Famoso, the Chief of Paleontology at the John Day Fossil Monument in Central Oregon. Experts from the northwest universities will also be in attendance. Members of NARG will present the University of Oregon and the Condon Collection an exemplary and historical specimen of a Spike Tooth salmon. 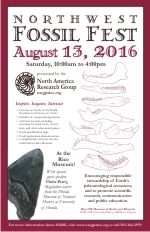 Dr. Ed Davis of the U of O will be on hand to accept the specimen and make remarks. 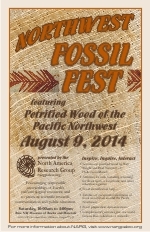 12:30pm: Fossil Horses in Oregon and the John Day Fossil Beds National Monument. 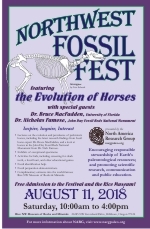 Dr. Nick Famoso of the John Day Fossil Beds National Monument will give a presentation on the latest understanding of fossil horses and their relationship to the paleoclimates of ancient Oregon. 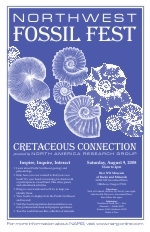 2:00pm: Fossil Horses and the Relationship to changing climates. Kids, have you ever wanted to find your own fossil? or participate in a fossil hunt. Learn to use the same preparation tools and techniques the professionals use to make fossils look cool. Learn to make an acetate peel from an ancient piece of wood to look at the internal cell structures. Plus other games and educational activities. 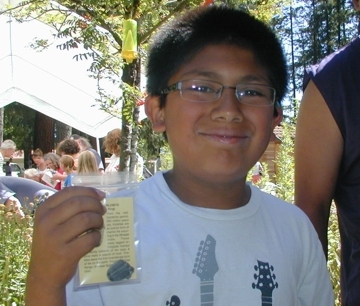 All kids will go home with free fossils. Bring in your fossils for identification help. to see how professionals clean and prepare specimens. Tour the world famous Rice collection of minerals. Free Admission to the Festival and the Museum. Saturday, 10am to 4pm, museum closes at 5pm. Directions: West of Portland, off Hwy. 26. Take the Helvetia Road exit, turn right and then take the first left, following signs to the museum. "The Giant Megalodon and what we know about it from teeth." Mike Full, Yamhill River Pleistocene Project and Dave Ellingson of the Woodburn Pleistocene locality at the high school. Brad Newport is the owner and operator of the Holleywood Ranch, one of the most abundant petrified wood localities on the planet! Brad gave an introductory talk about the ranch, his collection, and the history behind it all. MacKenzie lectured on the history of fossil investigations in the Pacific Northwest, highlighting the key individuals who have had a significant impact on the knowledge of our local fossil record. A lecture on the benefits of Stonerose not only as a fun place to visit but as a business that provides the public with a unique experience and the community with consistent tourism revenues. In addition, looking forward on what is the future of Stonerose? Dr. Jeff Myers, Western Oregon University. Dr. Myers will lectured on the history of paleontological research specifically relating to the John Day Fossil Beds. This was the lecture presented at last year's GSA conference. Gar Rothwell and Ruth Stockey are visiting guest professors of geology at Oregon State University. 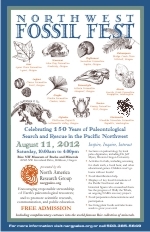 They have been studying fossils on Vancouver Island and Central Oregon and gave two lectures updating their recent discoveries. This includes a Jurassic wood locality near Izee that the professors have been using acetate peels to study details. 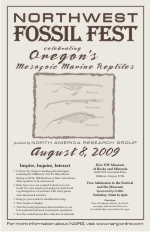 Dr. Orr presented a lecture on Oregon's "other fossil record" of vertebrate animals. Oregon is well known for the John Day Formation and all the interesting extinct animals that have been found in the fossil record. What isn't talked about much is the extraordinary record of tertiary marine mammals on the Western side of the Cascade Mountains. 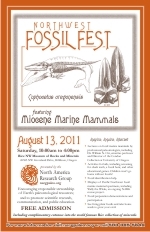 Learn more about the significance of the many specimens on display at the FossilFest. Dr. Bill Rember, Affiliate Assistant Professor of Geological Sciences at the University of Idaho and Director of the Tertiary Research Center, has been unearthing and studying the Clarkia fossil flora of northern Idaho for decades. These exquisitely preserved plant remains illustrate the diverse biota that thrived in this region when it was warmer about 15 million years ago. Many of the fossil leaves display their original autumn colors, while some still contain green chloroplasts and foster biochemical correlations with similar fossil species elsewhere in the world and with contemporary local plants. This presentation included numerous photographs of the Clarkia fossils, as well as a history of their formation and preservation. First discovered in 1972, the fossils were initially deposited in the sediments of a dammed Miocene lake. The cold, anoxic conditions and rapid sedimentation at the 100- to 150-meter depths of this narrow lake, as well as ensuing tectonic stability, have left northern Idaho with a unique, world-class collection of Miocene plant fossils. Dr. Rember is an active member of the White Pine Chapter of the Idaho Native Plant Society, who has generously offered his expertise through field trips and presentations for numerous organizations, effectively promoting ongoing interest and scientific knowledge of the significant but undervalued Clarkia fossil beds. While many people are familiar with the Stonerose Interpretive Center in Republic, Washington and its public access fossil site, the history leading up to the Formation of Stonerose is not as well known. 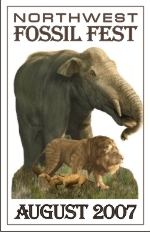 From the onset of gold fever in the 1890s to the modern day fossil bonanza, many changes in thinking and practices have occurred, all leading to the formation of an important and integral part of modern Eocene paleontology. Since first digging at the Stonerose fossil site 19 years ago, Karl Volkman has been hooked on fossils in general and the Republic fossils in particular. Karl is now the Collections Manager for Stonerose during the busy summer digging season and working toward a degree in paleontology during the off season.